Resistance bands are easily the most convenient and effective way to work on first step speed mechanics as it relates to acceleration and deceleration. Not only are bands easy to attach to the body but their ascending resistance allows athletes to load both acceleration and deceleration phases of running. It’s a well known fact that if an athlete can win the first 3 steps during a play in a game, they are probably going to experience good success continually throughout the game and probably win the event. Resistance bands make it very easy to train large groups of athletes to increase first step speed and reaction. As a coach, partner-based first step speed training requires minimal setup or space to implement and is relatively easy for athletes to quickly learn. As for the athlete, they are able to instantly feel the difference it makes on their quickness and agility within only a couple of training sessions. These two factors alone instantly make it successful. These drills are typically done in a partner attached setup with athletes alternating while performing 3 or 4 sets of 5 reps. Because these drills will emphasize acceleration, the athlete only has to focus on getting out quickly against the band resistance. Once learned, coaches can build in reaction starts through the use of whistle start hand signals. Once acceleration training is mastered, athletes can begin to work on deceleration by training under what is called a pre-loaded band setup. Performing the same drills, athletes now focus on learning how to decelerate under band-driven momentum. Just like applying weight to increase strength, the band applies a resistance that the body has to overcome in order to become stronger at decelerating or slowing down momentum. Once first step acceleration and deceleration speed drills are mastered, longer amplitude linear speed training can be implemented using a training approach called partner resisted running. With partner resisted running, partners work together to challenge each other to run under a controlled resistance for 15 to 20 yards. Partner resisted running allows athletes to now take their first step speed training through longer amplitudes of movement. The final way that resistance bands can be implemented into an off-season strength program is by using them to simulate non-traditional strength training drills like resisted crawling, towing, pushing or lunging. In many cases these types of drills are used with specially designed equipment that increases cost and the need for greater training space. With a flat band’s ability to attach onto the body in multiple ways, it allows them to provide resistance to non-traditional movements that, in turn, challenges total body strength and coordination. Flat continuously looped layered bands, like the Quantum Band, provides coaches and their athletes with the ability to train all aspects of performance. They also allow them to simulate specific exercises and unique training approaches that historically required specialized equipment and additional resources. Resistance band versatility makes it very easy and convenient to implement key aspects of an off-season training program without the need for added equipment, space or resources. 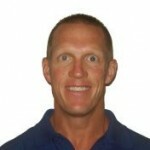 Dave Schmitz (aka…The Band Man) is the Co-Owner of Resistance Band Training Systems, LLC and the creator of https://resistancebandtraining.com, the only website exclusively devoted to training with large continuously looped resistance bands. 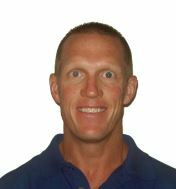 Dave has a unique professional background and vast experience as an orthopedic physical therapist, performance enhancement specialist, certified strength and conditioning specialist along with 27 plus years of living fitness and performance training. All of this has allowed him to turn a simple 41-inch resistance band into an incredibly multi-faceted total training experience for 1000’s of athletes and fitness enthusiasts around the world—while helping 100’s of fitness professionals and coaches get their clients or athletes BETTER with BANDS. The ability to combine bands with free weights, create efficient metabolic circuits and safely be used to introduce strength training to younger middle school athletes adds to their off-season versatility. Most off–season strength training programs are built around 6 or 8 week cycles that are designed to gradually improve absolute strength. In many cases after a cycle of this nature is completed the body needs what is called a de-load week. This is a week where an athlete is allowed to let their body recover, heal and re-energize after performing a multi-week cycle of heavy gravity-based free weight strength training. It is during this de-load week that resistance bands play a significant role in allowing the body to continue strength training while still allowing muscles and joints to recover. During this phase, barbell–band contrast training or band only exercises are implemented. This change of pace training allows the body to experience a completely different strength training stimulus while continuing to improve on common strength training patterns of movement. Here are a few examples of easy to implement contrast band training exercises using bands in conjunction with frequently used barbell exercises. As the off-season progresses, metabolic conditioning becomes increasingly more important in preparing the high school athlete for their upcoming pre-season. Resistance band’s ability to simulate any strength exercise while providing unlimited resistance and lightweight portability allows easy station circuit-based workouts to be set up and implemented anywhere. One of the safest ways to implement a middle school strength training program is through the use of body weight exercises. It teaches body awareness as well as core stability while still working against gravity. Unfortunately not all young middle school athletes can effectively perform simple body weight exercises like squats, push-ups, pull-ups or single leg squat variations. Resistance bands can supplement a body weight strength training program in 4 ways. First, they can be used to assist body weight exercises to allow athletes to learn how to properly perform basic body weight exercises through full ranges of motion. Second, bands can be used to apply added resistance to body weight exercises by quickly attaching the band onto the body. Third, bands can be used to create unique exercises besides body weight movements that can increase exercise variety while influencing movements body weight exercises can’t. Last, since most middle schools are not able to properly outfit a strength training room, resistance bands provide a highly cost effective way to introduce young middle school athletes to a simple strength training program. Part 3 will turn the focus towards using bands as a speed development training tool to enhance both acceleration and deceleration while training both linear and lateral planes of movement. As a strength and conditioning coach of a local high school where I have over 80 young high school athletes training in our weight room 4 days per week, I am constantly evaluating our efficiency and results. Resistance bands have easily been our most versatile and cost effective training tool to date. Not only do the kids find bands to be extremely challenging to train with, but they also enjoy the ability to improve their free weight training results. Anytime we can provide a training tool that motivates high school athletes to work harder, train more frequently and enjoy doing it, only good things happen. I would like to share 10 ways, as a coach, you can implement continuously looped resistance bands into a high school strength and conditioning program. No question the greatest impact on keeping young athletes healthy, besides strength training, is making sure their joints and muscles are able to move freely through a full range of motion on demand. A majority of youth injuries are directly associated with flexibility deficits due to frequent growth spurts. Unfortunately athletes do not like to stretch and if they do stretch, it’s often using simple body-weight movements performed poorly. Band stretching allows athletes to use the band to passively and actively lengthen out key muscles of the hip and shoulder. Using a tool, in this case the band, to stretch seems to provide athletes with an added motivation to routinely perform a dynamic stretching routine. This series of band stretches performed before every lift or running workout allows athletes to follow a routine program. Over time it creates permanent soft tissue length changes that athletes quickly recognize. What’s even more interesting is the longer athletes perform the band stretching routine, the more they begin to appreciate the importance of flexibility and how it directly impacts improvement in strength, speed and power. These are not often recognized as flexibility benefits. The importance of establishing good activation of the trunk and hip stabilizers pre-workout is pretty well documented. Using the same single band that was incorporated in the band stretching routine, athletes can quickly perform a series of resisted planks or hip stabilization exercises that will optimally prepare them for any running or lifting workout. This series of band stabilization drills makes it convenient and easy to flow directly from stretching into a muscle activation series of exercises. Free weight training should be a key part of any high school athletic-based strength program. However, regardless if that type of program emphasizes the use of kettlebells, dumbbells, barbells or sandbags, the type of resistance remains the same in that it is a gravity dependent constant resistance. Resistance bands provide an ascending resistance that is not reliant on gravity. As a result, continuously looped bands can be used to create auxiliary exercises following different planes of motion or movement patterns while impacting muscles significantly different than free weights. Combining straight plane free weight movements with multi-plane, multi-resistance vector band strength training allows the body to eliminate weak links in what is a total kinetic chain, tri-plane structure. Stay tuned for Part 2 which will cover how to use resistance bands to improve barbell strength and sport specific conditioning as well as using them to develop a safe and effective middle school strength development program. When Do You Train Young Athletes? "All sports require high degree of skill for superior performance. The major emphasis of a (youth athletic) training program should be skill excellence. For skills to be developed, learning should occur in non-fatigued states… It is advisable to schedule auxiliary training sessions either after a (sport) session or at some time that allows complete recovery from its execution so that no residual fatigue is carried over". I’ve never mentioned this in literature, but have advocated it several times through lectures and seminars. 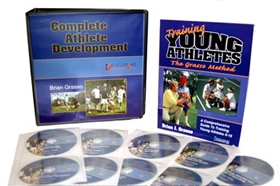 Learning how to create appropriate training sessions is crucial to working with young athletes. If you are forced to have the technical practice AND the training session within the same day (as is typical), make sure that the training session comes AFTER practice. This keeps the body and CNS rested and for skill acquisition and demonstration during practice. Does speed training come before or after strength training? When is it best to train the "core"? Where does flexibility training fit into the daily picture? It’s not a day-by-day concept or fly-by-the-seat-of-your-pants situation. successful and can be implemented by you TOMORROW with ease. 1.) The ability of muscle to lengthen during passive movements. 2.) Range of motion about a joint and surrounding musculature during passive movements. Mobility can also have two ways of being defined. The main definition is the state of being in motion. But this state of motion can be looked at within certain joints (subtalar mobility) or as a physical whole (moving from one position into the next during a run). Are both important to young athletes or is one more important than the other? This is a great question. Both are important for the older athlete (ages 14-18+) as athletes within this age group tend to show more restrictions with both flexibility and mobility, often times once you take care of the flexibility then you improve mobility. But with the younger athlete (ages 13 and under) I wouldn’t place much importance on either one unless there has been a certain injury that limits each. Are there different kinds of Flexibility, or is ‘bending over to touch my toes and stretch my hammy’ what all young athletes should be doing?